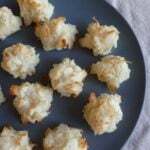 These coconut clouds are tasty, light cookies that are great for snacking between meals. The sweet coconut taste contrasts perfectly with the tangy ginger to create an enticing flavor that will keep you coming back for more. They are gluten-free, sugar-free and extremely addictive! Snacking healthily is a really important part of recovering from Candida overgrowth. It helps to keep your blood sugar stable, and avoids hunger pangs that can lead to bad decisions like eating sugar snacks. There are so many different names for sugar, that it has become very difficult to buy healthy snacks in the shops. Making your own is usually best. If you struggle to find healthy snacks when you are out of the house, put a few of these ‘clouds’ in a bag and take them with you. They are also perfect for taking on hikes, picnics, trips to the beach, or any other time when you need a quick and easy snack. Enjoy! In a large bowl, whisk egg whites until light and foamy. Add stevia, alcohol free vanilla and ginger, whisk to combine. Fold in shredded coconut and coconut flakes until just combined. Line a baking sheet with parchment paper. Drop tablespoon size mounds of coconut mixture onto baking sheet. Bake for 10 to 12 minutes or until cookies just begin to brown. Cool on baking sheet for 10 minutes before removing. Sorry, I misread the ingredients! 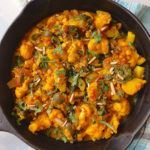 These sound yummy…am heading for the kitchen to make them…thanks Lisa.. I made these but forgot to leave out the egg yolks, they still came out chewy and give me that ‘cookie’ feel I want. I used xylitol for sweetener and sprinkled a little on top. How much xylitol did you use? I used 1 tsp but they weren’t very sweet. I don’t know if it’s the same strength as stevia? I am curious how important it is for alcohol free vanilla. Its really hard to find it without sugar added to it. Rocky Mountain oils makes a vanilla essential oil. Each drop is equivalent to 1 tsp. vanilla extract. It is alcohol free and gives me a lovely vanilla flavor! Do you have a food co-op in town. Ours stocks it. It is called Vanilla flavoring when it’s alcohol free. Love these! I make them without the stevia because I don’t like the taste and they’re still delicious. They’re my go to snack. Thank you!